A masterful Gigi Gryce medium up swing. Two different Gryce alto sax solos available as well as one Art Farmer trumpet solo. Lead sheets and second parts for two different arrangements. 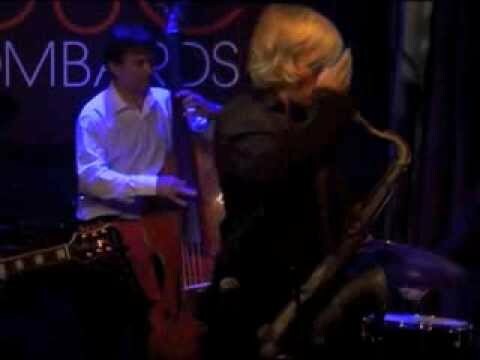 Grant Stewart, tenor sax; Yves Brouqui, guitar; Alain Jean-Marie, piano; Nicolas Rageau, bass; Bernd Reiter, drums. Don Sickler: "This is a classic Gigi Gryce composition. It makes for a fascinating study, both in composition and in arranging. Careful examination of this work alone reveals Gigi's masterful gifts and demonstrates how the combination of these two disciplines in the hand of a master bring fresh interpretations to the composition with every new recorded arrangement. "The audio excerpt for the 'Evening In Casablanca' recording starts at the top of the arrangement with two measures of sticks on hi-hat as the introduction. A1 melody: horns in octaves, A2 melody: horns in harmony." First about the lady: Nica (Baroness Pannonica de Koenigswarter) was a jazz patron and a friend and supporter of jazz artists. Many great jazz composers dedicated compositions to her. Obviously, Gigi knew she liked spirited tempos, thus his medium up swing tribute, Nica's Tempo. Gigi first recorded it in a quartet format with Thelonious Monk on October 15, 1955 (in the key of B-flat). Six days later he recorded the version featured here with Art Farmer (in E-flat). Next, for a June 11, 1956, recording he arranged it for Oscar Pettiford (12 instruments), then Art Blakey recorded it (quintet - December 13). In January 13, 1957, Gigi's Jazz Lab with Donald Byrd recorded it (nonet). In 1960 Gigi made the second quintet recording we've featured here (click the second album "The Hap'nin's") with trumpeter Richard Williams. Since then, many others have recorded this gem. Transcribed Trumpet and Alto Sax Solos from the "Evening In Casablanca" recording: both Gigi Gryce alto and Art Farmer trumpet start their solos over the succession of dominant 13 sharp-11 chords. Both solo audio excerpts start at their first choruses. In Michael Cochrane's one-chorus voicings, the three A sections are approached very differently. A1 uses smooth downward voice leading (based on the melody at first), while A2 voice-leads upward using planing (for example, the A9sus followed by B9sus in the 9th measure). The bridge is voiced simply, frequently without roots. C (the third A section) uses mostly six-note voicings in a higher register, with many common tones; often only one note moves between chords, such as the C minor to F7 in measures 3 and 4; these are voiced the same except for the resolution of B-flat to A. These footballs show one way Michael hears the solo chord progression move from chord to chord. When studying them, your concentration can be focused solely on the chord progression and how chords move from one to another. Rhythmically, it's simple whole notes and half notes, or the basic harmonic rhythm of the chord progression of the solo section. The footballs are also annotated, showing the original chord symbol above the voicing, as well as any extensions below the voicing. The idea is that these voicings could be of varied uses to any level of pianist—a beginner pianist could play the music exactly as on the page and provide a supportive and harmonically hip sounding accompaniment to a soloist, while a more advanced pianist could use these same voicings with varied rhythms in the style of the recording. Ultimately, a pianist would be able to absorb how these voicings were derived from the chord symbols, and then be able to create their own. "The audio excerpt for "The Hap'nin's" starts with horn A1 melody. The complete recording starts with piano playing the first eight measures of A1 rubato, then the drums set the tempo (eight measures). A1 melody: horns in harmony (horn melody altered); A2 melody: horns in harmony (further alterations)." In 1960 Gigi made our second featured quintet recording with trumpeter Richard Williams. Since then, many others have recorded this gem. Suggestion: Two master composers/arrangers deserving of more in-depth study are Gigi Gryce and Kenny Dorham. Very interesting papers or books could be written about their unique composing and arranging skills. Jazzleadsheets.com will be making more compositions by both artists available, as lead sheets or arrangements, as well as their transcribed solos. If you want to write about the music of Gryce or Dorham, or know of something that's already been written, let us know about it. Email Don Sickler at don@secondfloormusic.com. Transcribed Alto Sax Solo "The Hap'nin's" recording: Gigi alto solos over his new II-V solo progression. The audio excerpt starts at the beginning of his chorus. Our "Gigi Gryce Project" version is based on the arrangement from "The Hap'nin's" album (above left). The melody parts have all important rhythm section activity indicated below the staff; the rhythm section parts show the melody and second part, with rhythm section information in the same style. As with "The Hap'nin's" recording, the intro begins with solo piano playing the first A section rubato, followed by eight measures of drums to set the tempo. Not all of our Minus You audio tracks begin in the same way. Check out the explanation and the audio excerpts on the Minus You tab to see how each Minus You instrument's track begins. The solo changes for this version have a few alternate changes notated below the staff. These are occasionally implied by Richard Wyands and Peter Washington on the recording; pianists and bassists playing along with the Minus You tracks can play the alternate changes at any time, as most of them are tritone substitutions. Ralph Moore plays the melody on soprano sax but solos on tenor. Richard Wyands plays a solo rubato intro on this recording CLIP as he did on "The Hap'nin's" version CLIP. It's fascinating to compare these piano intros, recorded almost forty years apart. He uses similar voicings and fills for both, but in this later version he takes more time at the beginning and uses a narrower range of pitch. Richard recorded often at Rudy Van Gelder's studio. His assistant from 1986, our Maureen Sickler, tells us about Rudy's oft-expressed wish to create a CD comprised entirely of Richard's piano introductions. Every one was different yet perfect, even if the take later broke down. Don Sickler: Richard Wyands is certainly a very special gifted accompanist. Especially in ballads, featured artists often like the pianist to set them up with a solo introduction. It's hard to record more than one take of a ballad and I'm a firm believer that you have to go for it in one take. However, if you're not happy with your beginning, the tempo seems wrong, or something else is off, stop as soon as you detect the problem. This will let you then make a fresh start. But, the pianist will have to set you up again. This is where Richard Wyands' magic comes in. Having been in this scenario with him a number of times, I'm always amazed how Richard can just start again, always playing something entirely different that perfectly sets the mood and always inspires and sets the solo artist at ease. I certainly agree with Rudy. I wish I had all of his discarded set ups to hear again. I remember many were absolutely breathtaking. Note that the drum shout and the out melody together make one chorus; the D.S. goes to the B section of the melody. We have two Minus Melody tracks. The Practice Edition has four solo choruses, while the Performance Edition has two. For more information on the purpose of these two editions, check out Salute To Birdland and Minority, which have the same format for Minus Melody tracks. [clip] trio (minus melody: bass & drums only) By eliminating the comping piano track from the minus melody track, we made a track where the pianist can play the melody and be featured throughout. This bass & drums only track also works great as a feature for guitar or any other instrument (tenor saxophonist Sonny Rollins loved to play with just bass and drums, for example). Perfect for an audition tape.